Guardian screen doors are among the most widely used brand of window and door products. They have been around for decades and the design of their screen doors has changed over the years. What follows is information my customers and I have collected about guardian door repair and getting them working properly again when they wear out, get damaged or need replacement. Guardian screen doors from the 1960's are still very common. 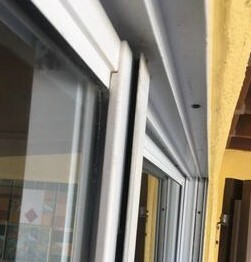 They were used on Guardians aluminum patio door system and they were really strong and long lasting. Many are still working fine today. Back then Guardian adapted one of the sashes used for patio door glass for use as the screen. This made a frame that was very strong. The sash was much thicker than present day screen doors as you can see in the picture below. The top fin is still a track and works perfectly fine with the top rollers on my DIY screen door kits. You can also see in the picture above that the top fin track is further away from the patio door than a normal screen door. My DIY screen door kit comes with an adjustable width black vinyl bugstrip that can you can peel strips off to match that wide gap. 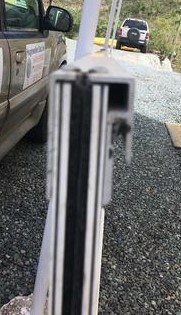 The vertical side jamb is the same width as the patio door panel. My DIY screen door kit will be more narrow and will still fit but you may want to install a C shaped aluminum rail so the new screen door has something to seal against. What follows are stories visitors to this website have submitted about their own experience with Guardian screen doors. If you have something you would like to add like for the form at the bottom of the page. I believe I have Guardian patio doors. They are a bit older but I would like to add a screen so I can enjoy my Minnesota summers with out the bugs! The screen door would be 34x48...thats the measurement from inside all of the channels, its the absolute biggest any parts of the screen or rollers could be. I guess I was just confused on ordering a custom screen. That measurement would be like a "rough" opening when installing a window, nothing can be longer or higher than that. I could send pictures if that would help! My screen door kits include the door frame, corners, rollers, screen cloth, spline, screen installation tool, instructions and delivery. Guardian screen doors - How do you Remove ? Cannot figure out how to remove screen door. I have loosened the screws top and bottom, but the door fits snugly and I cannot raise to get bottom over rail or push down to get top out of groove. 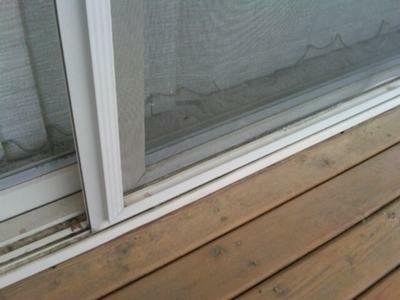 If there is no gap between the top of the screen door and the patio door frame then your patio door frame is sagging. This happens when the wooden frame of the house settles over time. Measure the height of the patio door frame on the left, on the right and in the middle. Is there a big difference in the measurements in the middle ? To fix the problem you need to remove the door casing on the inside on the top of the patio door. 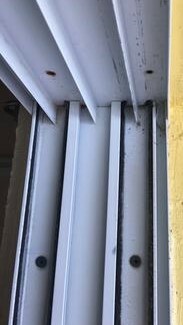 There should be 3 shims across the top of the door held in by screws going through the patio door frame. Take out the screws and remove the shims. That should fix the problem and you should be able to remove the screen door as normal. If this does not fix the problem the settling is so bad that you will need to have the opening reframed and a new patio door installed. I just purchased a new home and the sliding door doesn't have a screen. the typical replacement is 77 5/8 - 80 inches and i can't get the screen to fit. is there a size shorter than 77 5/8 ? Even though every manufacturer makes patio doors to fit standard openings, the actual size of the screen door and operating panels in the door are always custom. 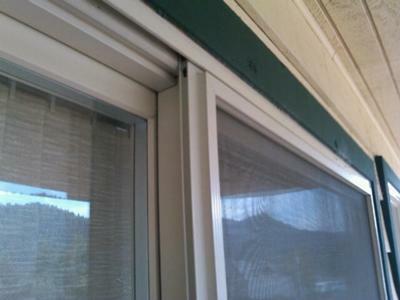 My screen door kits are custom made to fit any height or width. All you have to do is give me the measurements you need. The Screen door kit page is the place to start. If you need help measuring the right size screen door for the door you have see the screen door kit measuring page. You can also email me pictures of your existing door and I will help you measure it. Send me pictures of the header or top of the door, the sill or the bottom of the door and a picture taken outside showing the whole door. My email address is near the bottom of the home page. I too am looking for Guardian door parts. I live in Wisconsin. I was wondering about their warranty as I have several patio doors where the seals are broken and I now have mold growing in between the glass. Any help would be much appreciated.